on Vancouver Island’s beautiful west coast. To be held at the Community Centre, Campbell River, B.C. Campbell River Art Expo boasts Vancouver Island’s breathtaking 360° view of ocean, rivers, lakes, mountains, forests, and wildlife. In addition to this fabulous show we are hosting our spectacular Gala Event on no date yet. Art Battle, a fun filled evening with contestants competing against each other, in three rounds of 20 minutes each, Friday, July 6th, 2018. Saturday evening, July 7, 2018 is a glamorous event, the art of art, the art of music, and the art of food. Tapa style hors d’oeuvres, cocktails, and a prestigious art auction, is the highlight of this must attend evening. An engaging night with art enthusiasts and artists alike. WE’RE LOOKING FOR MORE ARTISTS! Advance your presence in the professional art community and boost your sales. We have a 70 booth capacity, as well as wall space that can be purchased separately, if you do not have a booth. Secure your space now by registering on the Registration Form Section on this website. [/av_textblock] [/av_one_full][av_one_half first min_height=” vertical_alignment=” space=” custom_margin=” margin=’0px’ padding=’0px’ border=” border_color=” radius=’0px’ background_color=” src=” background_position=’top left’ background_repeat=’no-repeat’ animation=” mobile_breaking=” mobile_display=”] [av_heading tag=’h3′ padding=’19’ heading=’ARTIST BOOTH RULES & REGULATIONS’ color=” style=” custom_font=” size=” subheading_active=” subheading_size=’15’ custom_class=” admin_preview_bg=” av-desktop-hide=” av-medium-hide=” av-small-hide=” av-mini-hide=” av-medium-font-size-title=” av-small-font-size-title=” av-mini-font-size-title=” av-medium-font-size=” av-small-font-size=” av-mini-font-size=”][/av_heading] [av_textblock size=” font_color=” color=” av-medium-font-size=” av-small-font-size=” av-mini-font-size=” admin_preview_bg=”] By submitting an application the exhibitors agree to abide by the rules of the C.R. Art Expo. Original Work Only – no limited edition prints or reproductions will be allowed on the floor (prints will be in the print store only). The artists also agree to comply with any reasonable request by show officials with regards to their displays and conduct. Artists also agree to the use of their photos and bios for promotional purposes. One primary goal for the C.R. Expo is to provide a venue for artists who work with traditional mediums to produce two and three-dimensional art in realistic, abstract, impressionistic, contemporary, expressionistic and modern styles. The use of oils, acrylics, watercolours, inks, graphite, pastel, charcoal, conte, encaustic, tempera, carbon, gauche, coloured pencil and watercolour pencil are the accepted mediums. Printmaking is allowed providing the prints are hand pulled and the run remains under 100. The 2018 show has focused primarily on painters, but going forward we will be accepting applications for sculptures, and various other art forms. Set up begins at 8:00 am Friday July 6, 2018 with grand opening at 12:00 noon, opening up to the public until 5:00 pm. Saturday opens at 10:00 am and goes until 5:00 pm. Sunday July 8th opens at 10:00 concluding at 3:00 pm. Exhibitors must show for the entire allocated times. As last year your spaces will be clearly marked and numbered. You will receive notification of your space number as well as an attendant will assist the morning of set up. Each booth is 10×10 space. Artists can apply for more than one space. Spaces will be allocated on a first come first serve basis. Refunds will be available – less $15 administration fee- if notice is given by email on or before 3 weeks before the show date. Any cancellations after this date will not be entitled to a refund. You will be notified by email upon your acceptance. If for some reason your application is not accepted, a full refund will be given. 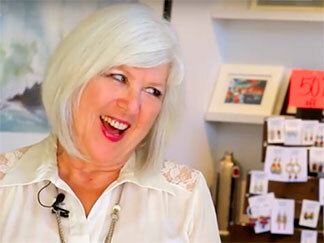 A very important aspect of showing original art is to promote the value of “investing” in art. Therefore no discounted pieces will be allowed in the show. All artists will be responsible for their own sales, except for the print store, where the attendees will accept payment for your prints. Payment will be forwarded to the artist within 10 working days after the show. Charolette a message with any questions, comments or concerns. 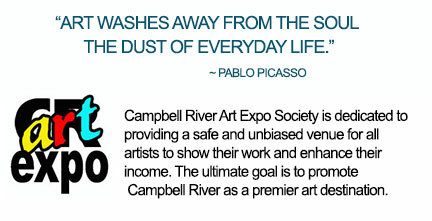 Here you can register for one or more 10×10 booths at the Campbell River ART Expo. If you don’t have a tent, we can rent you wall space, the cost is $50 per wall. Submit three pieces of your favourite pieces of art to: aworldabout.com to be one of 10 select artists featured at the Gala Event. Cutoff is June 25, 2018.